When space is premium at the helm, a compact entertainment solution is needed to blend performance and subtlety. There's no room for compromise, because every boat needs a Fusion beat. 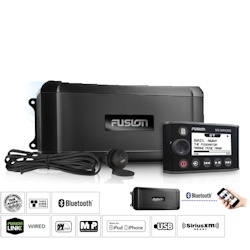 This is a fully featured Black Box Entertainment System MS-BB300R, with Fusion-Link™ via NMEA 2000 control, Bluetooth audio streaming and Multi-Zone™ technology. A true plug and play' compact entertainment powerhouse, the MS-BB300R is compatible with the world's leading Multi-Function Displays for intuitive True-Marine™ audio playback and easy, total control. The MS-BB300R is an elegant solution for when there's limited space at the helm. An MS-NRX300 IPX7 NMEA 2000 Wired Remote Control is included for intuitive system navigation, featuring a large LCD display and easy scroll rotary encoder, for a familiar Fusion True-Marine™ experience. Also included is a combined 3.5 mm and USB auxiliary panel mount connector for easy integration of supported devices. The MS-BB300 and MS-NRX300 are supported by an industry leading 3-Year limited consumer warranty. The MS-NRX300 NMEA 2000 Certified Wired Remote Control is an out of the box solution for adding localized control of a compatible FUSION marine entertainment system to any vessel. The MS-NRX300 features a sleek new innovation: the glass helm flush mounting option. You can now choose either a flush mount for a stunning glass helm finish, or you can easily install with the conventional dash mount finish. Either way, the feature packed MS-NRX300 will give you everything you want from a wired remote and more. Install a remote in each independent audio zone, up to four zones depending on your FUSION marine entertainment system, to create localized volume control, as well as, global source control. Now you have even more control in creating a customized audio entertainment experience around your vessel. Perfect for installation on a swim platform, deck or within the cabins, the MS-NRX300 is designed and engineered for the marine environment. Once connected, the wired remote will double as a NMEA Repeater. MS-NRX300 sports a large, high contrast, daylight viewable display making it easy to navigate and stay in control of your audio entertainment experience. Cutout: 8-11/16" dia., Mounting Depth: 5-1/8"